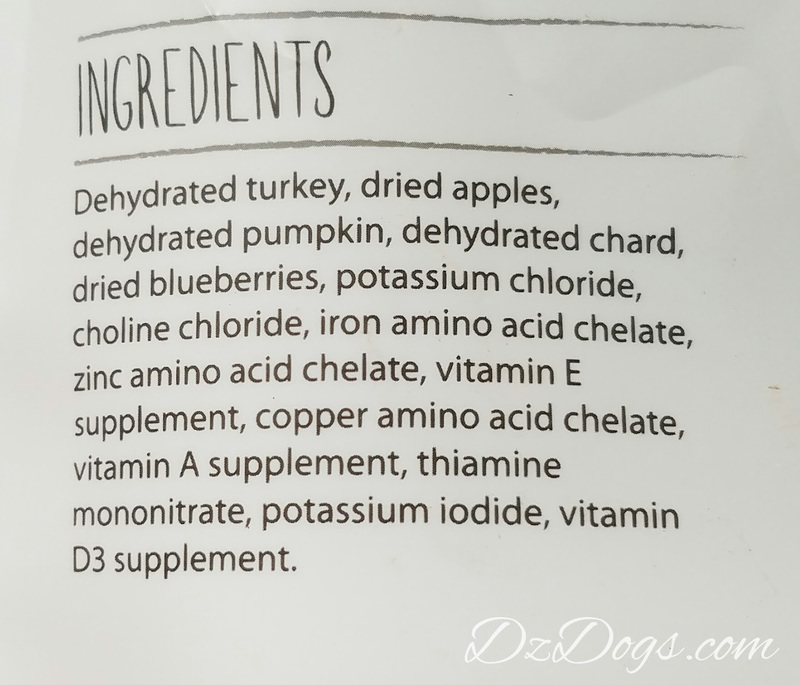 DZ's Adventures: Rotational Diet Fun! 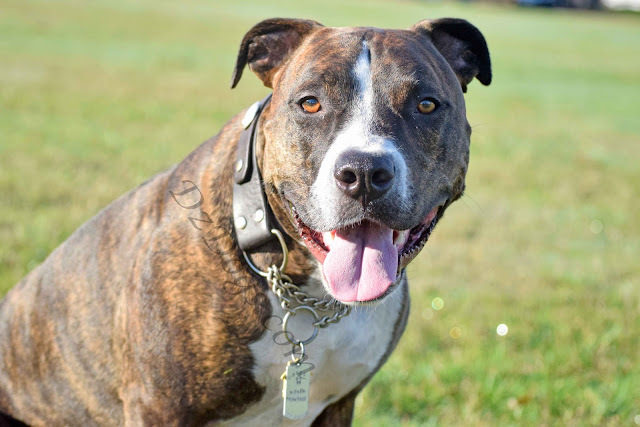 When we first adopted Dante he was on a terrible brand of kibbles consisting mostly of fillers and we didn't have the opportunity to switch him slowly to a new food, this caused a nasty tummy upset. We then dealt with discovering food allergies, turns out he has a chicken intolerance - it gives him gas and diarrhea. Through trial and error, we finally figured it out and he hasn't had an issue since! 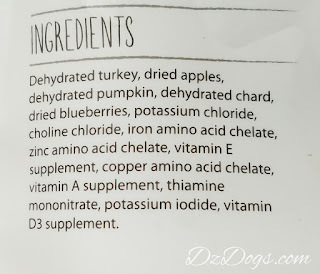 Contrary to popular belief, just because your dog has a chicken intolerance doesn't mean that they can't have any poultry. Chicken, turkey, and duck for example are all different species of birds each having a unique genetic makeup. 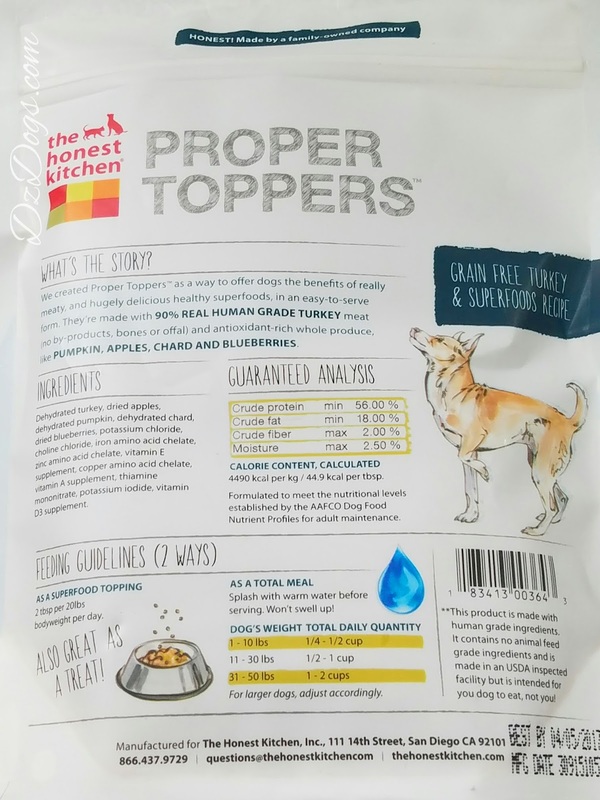 As well as feeding rotationally I like to add ingredients to Dante and Ziva's dish, so for this month's Chewy Review we chose the Honest Kitchen Proper Toppers, turkey formula! Thanks to the recent sale of our home we have temporarily moved in with my parents. Homeless Hounds HERE. This has been quite a stress (in a good way!) for everyone as we figure out our new routines. I know the dogs have been stressed because they are skipping meals - which is abnormal for them. And they are running around on 5 acres so they are getting WAY more exercise than normal. 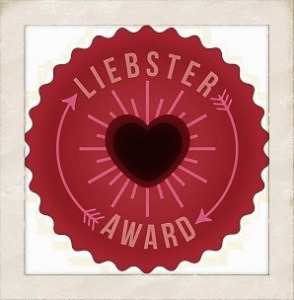 So this fun little treat arrived with perfect timing for us! These Toppers come in two sizes, ranging from $9.99 for a 5 ounce bag, and $19.99 for a 14 ounce bag. 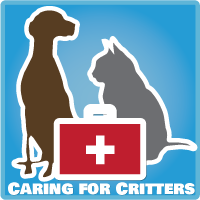 Chewy often has discounts and specials though so I highly recommend price checking with them online before your purchase from your local pet food store, and don't worry - they ship fast so you'll have your order in no time! 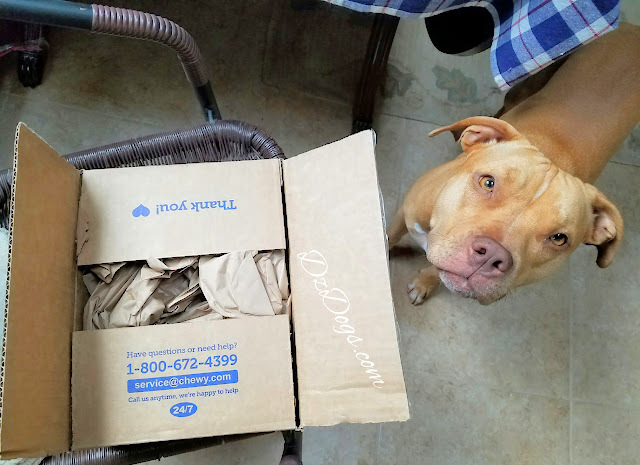 Dante and Ziva were pretty excited about helping open up the box! The first thing that you'll notice about the ingredients is that their are no artificial colors, flavors, or preservatives. Honest Kitchen also uses non genetically modified ingredients, no chemicals, and all of their meat is hormone and antibiotic free. We also liked that they are grain free and made from human grade ingredients! Why is human grade important? 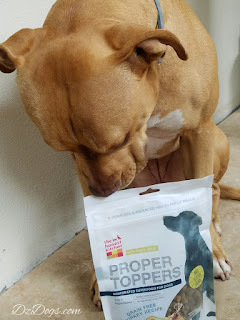 Typically, pet grade foods are filled with the leftovers from human food manufacturing, human grade food that doesn't make the "cut" so to speak is not left to go to waste - this means that indigestible wastes, and byproducts are what make it into the pet food. Their are two sources of meat used for pet grade food. #1 - federally inspected USDA meat packing plants, meat that fails inspection be it for reasons of damage, disease, or cancerous tumors are separated for shipping into pet food plants. #2 - 4D animals.. This is where things get scary. 4D animals are either dead, dying, diseased, or disabled. These animals are cooked, "rendered" is the term used, and then used for livestock feed, fertilizer, and pet food ingredients. Grocery store brands, and mass marketed pet diets use typically cheap sources for their pet food - I'll let you chew on that one for a bit. 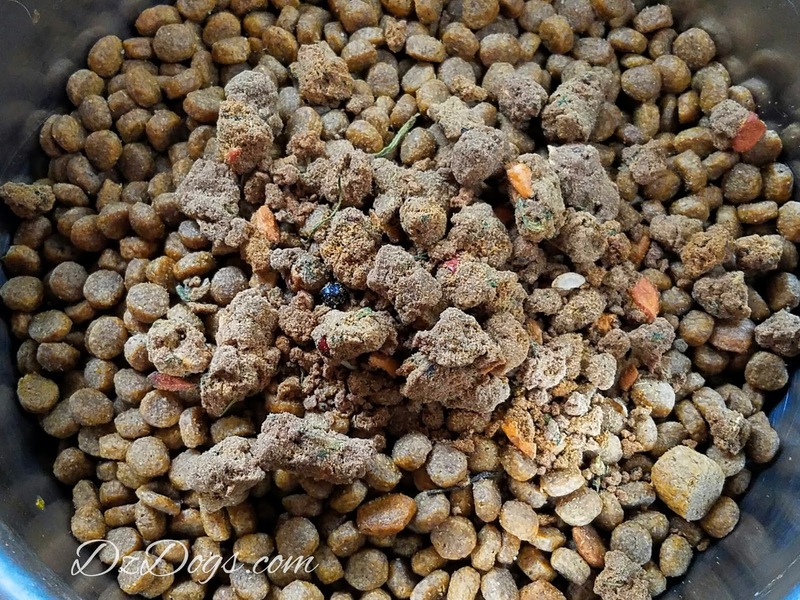 What are you feeding your pet? 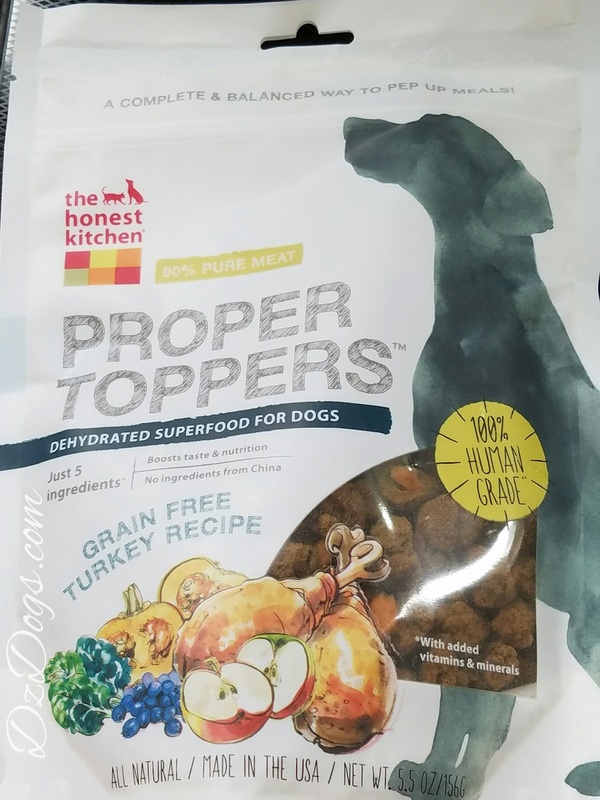 However, thanks to an ever changing market and the demand of savvy pet parents their are now many companies to choose from that offer high quality, healthy pet food. 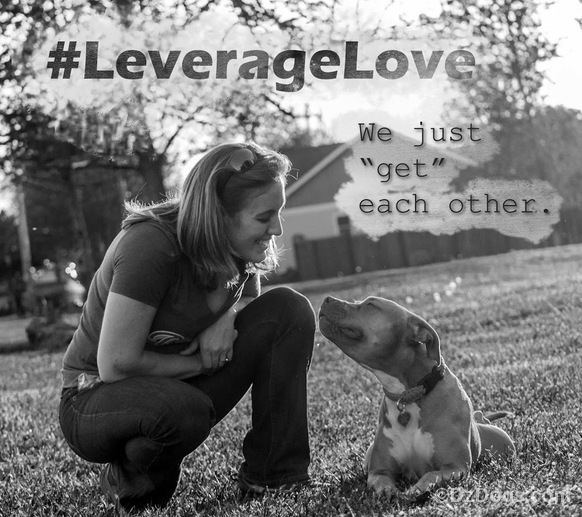 I figure, we eat healthy, so why shouldn't my dogs? Can you spot the dehydrated fruits? Yumm! 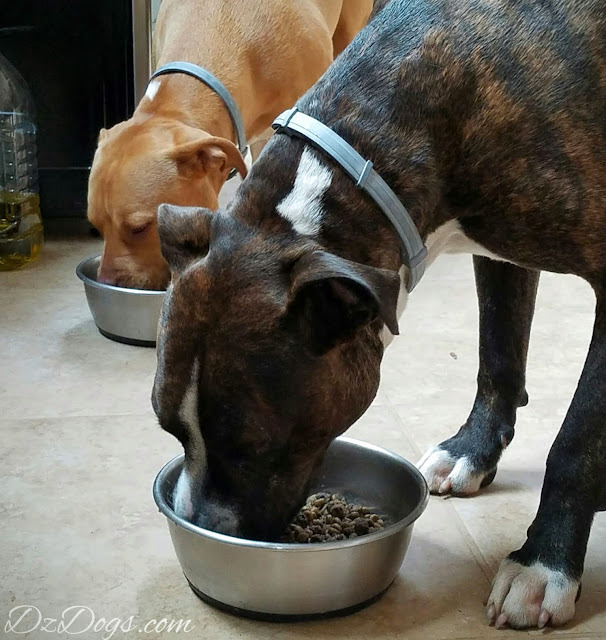 Thanks to the Proper Toppers Dante and Ziva have been eating full meals again! And I have peace of mind knowing that what they are eating is full of great ingredients. Now normally I don't bribe my dogs. I put their food down and when they walk away I pick it up. They are both really good at monitoring when they are full (unlike some previous fosters we've had) so sometimes they leave kibbles behind. But when I know they are burning more calories than usual I don't like it when they skip meals. Another great thing that I love about the Honest Kitchen products is that being dehydrated they are very lightweight, perfect for camping and backpacking which we'll be doing a lot of this summer. 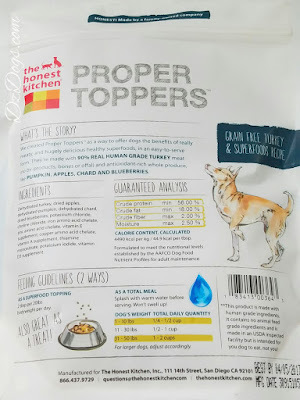 If you haven't tried out Honest Kitchen before, the Proper Toppers are a great introduction into their products! Those look delish! Do you think they would go well with ice cream? Icecream?! Great idea and yes i'm sure it would go great!! We keep reading about the rotational diet. We need to do some more research on it! It's easy and fun! We just switch either the protein, same brand. Or different brand, same protein. I used to switch slowly but now I just switch them over and at this point they are pretty used to it so we don't have any tummy upset issues. The dogs have tried at this point turkey, duck, bison, venison, lamb...and lots of different top grade brands. :-) I need to write a full post on it sometime. I'm glad Nola loves these too!